AT COSGRAY CHRISTMAS TREES, you will find several varieties and sizes of trees to choose from including two varieties of pine trees ranging from 3’-12’, and several varieties of fir and spruce trees ranging from 5’-18’. 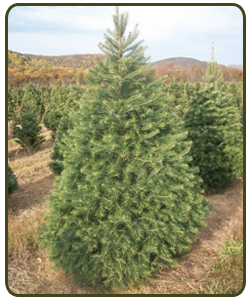 We offer choose and cut your own trees for those who want to make this a family adventure, pre-cut trees, ball and burlap trees, and wholesale trees. Listed below are the tree types grown on our farm, along with a picture and short description of the characteristics of each tree type. Many of our trees are grown for Christmas trees, but some are also available for Nursery Stock. Please contact us if you have any questions, we would be happy to provide you with information and help you find your perfect Cosgray Christmas Tree! Scotch pine has historically been the most popular Christmas tree in the U.S. It is known for its firm branches and typically holds it needles for four weeks. It is well suited for heavy ornaments, and needles will stay on even when dry. White pine has long, soft, flexible needles and is blueish-green in color. 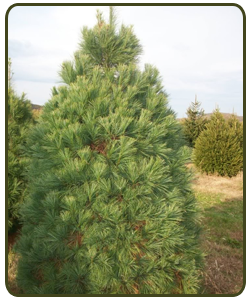 White Pine's have good to excellent needle retention, but have little aroma. Great for people with allergies. 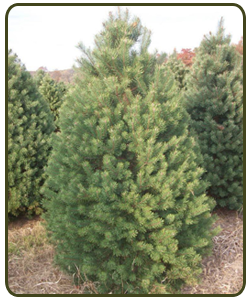 Canaan fir is a newer variety that is becoming a very popular choice as a Christmas tree. 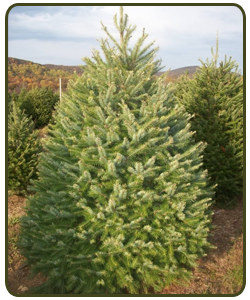 It has firm branch with soft short needles and has characteristics similar to both the Balsam and Fraser fir. 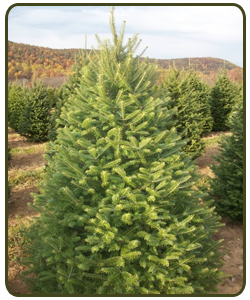 Fraser fir is dark blue-green in color, and has a pleasant scent, good form, and excellent needle retention. The branches are firm and turn slightly upward with a soft short needle. This species has soft needles that are dark green-blue green in color and are approximately 1 – 1 ½ in. in length. The Douglas fir needles radiate in all directions from the branch, and when crushed, these needles have a sweet fragrance. 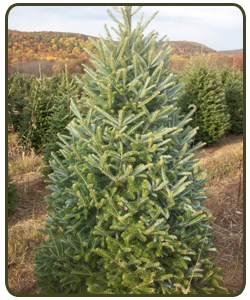 They are one of the top major Christmas tree species in the U.S.
Concolor fir, also known as White fir, has a narrow needle with good color and excellent needle retention. It has a pleasing shape and citrus aroma. Used primarily in our area for landscaping.